Don't know how to encourage customers to buy more? Simply show them relevant related products which are usually viewed or bought together with the item they've already selected. Due to the Automatic Related Products Magento Extension you'll be able to display special blocks with cross-sells, up-sells and related items based on customer purchase behavior. A specially developed algorithm lets you show necessary items in each particular related products block. With the Magento 1 related products tool you can place cross-sells, up-sells and recommended products to separate blocks to show a wider variety of items. Display cross-selling products on a shopping cart page to boost spontaneous purchases. Due to a special algorithm the module automatically defines which products are frequently viewed or purchased together with the chosen one and displays corresponding results in each Magento associated products block. Promote products that attract less views and generate less sales. Use the special 'Product Currently Viewed' data source to effectively display items without the history of interactions based on various conditions, including the category, brand, and price. To accurately gather statistics for products display specify the time period basing on which the products will be shown. The auto related products system for Magento will filter relevant items and show them to customers. The Related Products Magento module lets you hide out of stock items from display to show only the products that can be immediately purchased, thus significantly improving customer experience. Flexible extension settings enable you to choose whether to display related products either viewed together with chosen items or bought together. Set an order status for 'bought together' products to make statistical data maximally precise. Due to automatic matching of up-selling, cross-selling and related items, you don't have to relate them manually. Apart from that, you can replace manually related products with the ones matched automatically. You can display products from any category or from the same categories with the chosen items. 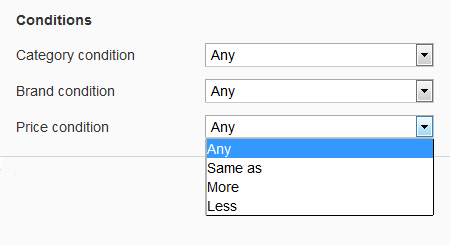 The auto related products Magento module also lets you exclude items from specific categories if necessary. Show relevant up-selling and related products depending on their brand for highly targeted results. Configure price conditions for up-sells and related products to show a rich variety of products in each Magento related products block. E.g. Use 'higher price' option for up-sells and 'same' or 'lower' price for related items. With this extension i don't have to manually add automatic related products, upsell & cross sell products. It automatically calculates data on customer viewed product & show them in upsell relate product,cross sell, upsell block. Best feature is i can limit the products to 4. Support team help me to make compatible with third party extension. I am happy to recommend this extension who want extra functionality in their store saving valuable time. We had to hide products with negative stock quantity manually, which is rather pricey and fruitless. With the Amasty extension we get things done even without admin’s help. Besides, the customer support is always online and in touch. Appreciate your time and effort! I’ve run Automatic Related Products for a week already and can say it saves time and money spent on my webstore correcting. It really does well, as we exceeded the sales plan twice. An absolutely competent team of developers. After expanding my shop with more than 7000 item numbers, Automatic Related Products is a Must Have. Purchased installation along with extension and Amasty was quick about installing. It's an extension that does not make the shop slow - so will definitely recommend it to all webshop owners - it's not to be missed. – New: added the 'Product Currently Viewed' data source. It allows you to display products without views or joint purchases history. You can configure the automatic display of products from the same category, from the same brand, and based on their price. – New: added the 'Show related products only for Out of stock' option. Now, you can display related products only for those items that are currently out of stock. – New feature: ability to show only products from categories is added. – Fixed issue with empty collection for manually added products.